My Mother was Italian. Born of Italian parents she was similar in nature to my Grandmother. 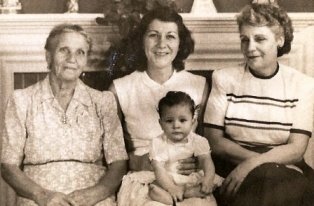 She excelled as a homemaker and her parents recognized that early in life. When she was young, she worked and managed a coffee shop and luncheonette. She loved the excitement but due to the old-ways her career and career intentions were cut short. However, everyone who ate or had coffee at the shop said she was the one that made it a success because it was her creativity in the kitchen that made it such a success. When we were young, Mom made sure we girls had the cutest outfits and for every holiday, we got dressed up and felt like princesses for the event. Mom was also the person who kept us in line and made my father's evening pleasant when he came home. Holidays were always celebrated and were an event for us. Her skills inside the home were un-matched. She made sure the house was organized and decorated with tasteful decorations and our job was to help set tables, get the fine china and best silverware out and polished before it was placed. Very few family members could prepare a family dinner providing a great variety of Italian dishes and have everything come out of the oven, refrigerator and be served like it was a walk in the park. And, nary a day went by that dinner was less than excellent. Mom also volunteered and loved the Opera. For years she volunteered as a member of the local opera guild. She loved those years and felt right at home with other members and perfect strangers. After an automobile accident, she spent a lot more time at home and only ventured out with Dad. As the oldest in the family, it became my responsibility to do the shopping and take my brother to school, activities and friends. I learned a lot about home-making or as they called it then, "home economics." As Mom became more confident, she started driving again and became a real estate agent selling properties in and around West Hartford, CT. I also became her helper and sat at many open houses keeping her company and handing out home information. I did a lot with my mother and was always there for her. When I was married, I kept in touch with Mom on a weekly basis. While all I learned from her growing up did me well in my early years of marriage, we would converse as friends. She knew what was going on in my marriage and guided me in raising my only daughter. Whenever I had a question about what was wrong with Jaime, Mom gave me sage advice, which I carried with me even when we were out of reach. When Mom passed suddenly her life and mine together ended. We had become very close the last five years she was alive and while there was little she could offer me in raising children, her undying belief in her role as a home-maker and wife was exemplified in how she took care of my father. Even as my father was getting better and was well enough to do for himself, she doted on him and made sure his needs, wants and desires were attended. While my husband says not to dote over him, my constant thoughts are to insure his health and welfare. There are a number of things I do differently as the woman of the house, but basically I am a reflection of my Mother and will always take to heart the lessons learned from her.